This applet calculates the area of a sector. 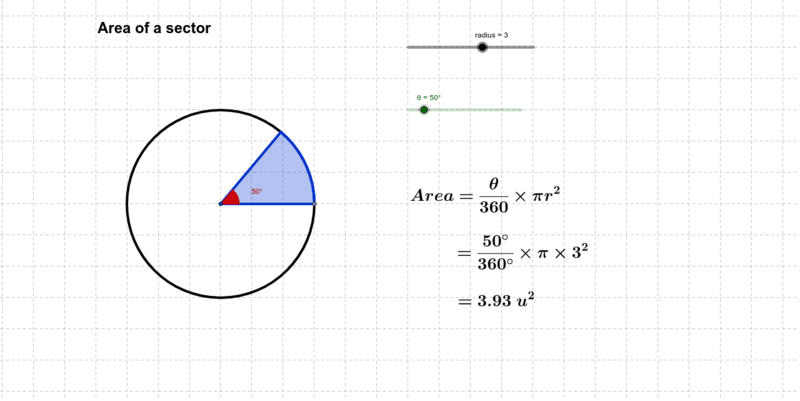 The two sliders vary the radius and the angle of the sector of a circle. Use this applet to answer the following questions: 3. For what angle for a sector does the formula for the area of a sector look like the formula for the area of a circle? 4. For any given radius r, what is minimum area of a sector (nearest whole degree)? Change the values of the angle of the sector and radius of the sector. See how to find the area of the sector (blue area).